Welcome to the DroneAge, where people act like robots and share dumb ideas at light speed! Episode #601: Climate change makes you lonely and fat. Feeling friendless, floppy and like a loser? It’s not your fault. Blame a coal plant. Blame Exxon. Blame anyone but yourself. It’s your bad luck to be born into the most bountiful, benevolent era in human history. Damn! Lonely, unfit and hooked on air-conditioning – is this the summer of the future? In Perth, cricket fans avoided an historic Test fixture amid predictions of 38-degree days. Sun melted a coastal highway filled with holidaymakers in northern NSW. Victoria’s coal generators shut down. Tasmania burned. And rotting fish corpses lining the Darling River at Menindee forced anglers to seriously rethink their plans. Are we kidding? Thirty-eight degrees is just a summer’s day in Perth. It’s something that happens 19 years out of 20. As for coal generators shutting down: we’ve spent 20 years trying to drive them out of business to stop climate change, and now, if they don’t work, that proves climate change is real? The reasoning is so circular it could give people whiplash. Let’s not forget coal plants run at 550 degrees plus (unless they run at 1000C). They don’t shut down when it gets two degrees hotter outside, they are some of the last generators running. They outlast even the nuclear plants. (Not that we have any of those). It was not what the Griffith University professor had planned. But as a monster heatwave baked a crust onto southern Australia, “it was not possible to be outside at all”, he says. “I couldn’t do anything, I was basically just in the car all the time. Even then I got fried because the sunshine was so hot, it went through the glass,” Stantic recalls. Sure. Hot sunshine goes through glass. Cold sunshine, of course, bounces right off. The nonsense never ends. So he cut his holiday short. Once, long ago, my parents drove 4,000km right across Australia in January, including 700km of dirt road over the Nullabor in an un-air-conditioned EJ Holden. They couldn’t put the windows down or the car would fill up with dust. At times the car was over 50C inside. Somehow they survived, and even had fun. In the 1800′s people did it on horseback (if they were lucky). If they weren’t lucky, they walked from Perth to Kalgoorlie with wheelbarrows. No fans, no fridges, no phones. What a bunch of fat unfit sissies we are. As for dead fish — plenty of those in 1932. Dead fish, dead birds, and even a dead baby. The mercury hit 120F in Collarenebri. (That’s 50C, again, just another one among our long list of 50C temps). You know it must be climate change when things are almost as hot and deadly 87 years later. Mass fish and bird deaths in 1932 prove climate change was something that happened all the time. At Observatory Hill in Sydney, it hasn’t even reached 40 degrees once this summer, despite building brick walls and giant freeways next to the thermometer to help it stay warm. They’ve switched to electronic one-second-record thermometers too which you’d think could electronically pluck a 40C out of gusts of car exhaust coming off the freeway. The record-smashing temperatures of recent weeks have made it very clear: climate change has arrived. Depictions of a world almost too hot for humans are no longer an abstraction. Summer has changed, and so must we. Hasham writes like a Hollywood marketing groupie. Where are the hard questions? The counter-points? Any semblance of critique? Today people “on low incomes” we’re told, are lying on the floor because they can’t afford air conditioning. “They would literally lie on the floor in the coolest part of the house and not move for hours,” [Dr Louise] Crabtree says. They are trapped in their homes “because they don’t have transport options that are affordable and cool.” It’s like a Soviet Gulag I tell you! We’ve spent 30 years telling people to live in high density apartments and catch buses so they can stop heat waves. But now they are imprisoned at home in heatwaves that keep coming, and what they really need is a car, cheap petrol and a garage at home to park it. Blast-furnace ambient temperatures also turn people off physical exercise. “If it’s just too hot and a walk to the bus stop is too far and the bus stop has no shade, people will stop walking. It’s very much impacting how much people are walking or bicycling,” Crabtree says. Is the real problem the heat waves that Australia has always had, or is it that people can’t afford fuel and energy since the government decided we should try to change the weather instead? In Perth, cricket fans avoided an historic Test fixture amid predictions of 38-degree days. Pfffft 38 is about right . You should try living in Western NSW and experience over 40C dry heat and dust. That’s Summer time for as long as I have been going there, over 50 years. I’ve sat in the sun in around 33C in the open at the cricket and wont do it again. It is just unpleasant. So what if somewhere else is worse? You have a point? It’s normal Summer conditions in The Sunburnt Country. Doesn’t mean I have to risk sunburn. So your point was what? This bloke is so dumb he just will never get it. Are you a mad dog or an Englishman? FFS GA cricket crowds were low at every test not due to hot weather but because no one wants to watch cheats!!! and cricket interferes with screen time. I know… but still you wont see the exposed seats fill on a hot day, now or 50 years ago. Some of the seat holders might be at the ground. You have to book a seat to get entry to the bar. In 1968 I was lucky enough to be driving a Brabham Repco, in the Australian Gold star our Formula 1 championship. It consisted of a group of races spread around the country, with the highest total of points scored in each race giving championship. The South Australian race was at Mallala, on the 14Th of October, hardly the height of summer. After the race I had to throw out my visor, as we could not clean the bitumen off the thing, as it was etched into the surface. It was etched in because it had been very hot when it hit the visor. You see even in October areas of the track had melted in the heat. I don’t know how hot it was, I was a bit busy to check the temperature during the race, but it was hot enough to melt the track. So even in October, 50 years ago, it got hot enough to melt the roadway. Could it have been the CO2 our cars were exhausting that caused it? Great English fast bowler Alec Bedser once made the comment along the lines “I opened the bowling at Adelaide Oval in the early 1950s. It was 114 degrees and I bowled twenty overs in my first spell”. And they were 8 ball overs! At 114 I wet my bucket hat. With all due respect, I would suggest that the current crisis in Australian cricket viz ball tampering and poor results had more to do with the poor attendance than a sunny day. I’ve played cricket in temperatures of 40 degrees. It caused us sometimes to (shudder at the thought!) need a drink of water before waiting the usual two hour break. And to use it as an excuse for an extra beer when the job was done. As for heat stress? The winner of the toss might consider that when deciding whether to bat or bowl, but it evened out in the long run. This is so close to ‘Atlas Shrugged’ it’s not even funny. And, Jo Nova has all the wonderful characteristics of Dagny Taggart, in my opinion. But who is John Galt? Don’t worry, I bet Bunnings will have special safe spaces on sale for them soon. I believe they used to be called playpens. When you don’t take the past into account, you don’t have much of a future. When your policy makers don’t take the past into account you don’t have a future. Soon, you won’t have to worry about not having a future because you will cease to exist. That is “their” goal: for you to cease to exist. Despite the constant scare mongering by television news weather presenters using emotive words to describe normal summer temperatures I believe most of us are unimpressed. My son is a builder and when people mention how hot they feel he replies that people like himself who work outdoors most of the time it is normal summer conditions. And that if people went outdoors more often away from air conditioning they might not feel so uncomfortable outside. It is rather silly for people to be influenced by weather “talking heads” but continue on “scorching hot” days to go to the beach, go surfing, go fishing and boating, play golf and all the other outdoor activities most Australians enjoy. Maybe too many inherited a witch doctor gene? No need for a gun just point a bone at them. The stupid thing is..when you walk out of an air-con area (especially one that has been wound down to at least 22C) it feels dam hot, but when you stay out for a while it feels normal. Thats why these bozos think everything is a heatwave. Its perception. Dennis – or a thermometer! My father told a story from back in the 1940s. It was harvest time, and he and a neighbour were sewing bags of wheat in the paddock by the house. It was hot. Being so close to the house, they did not pack lunch, but walked home. There they discovered the thermometer was reading 106 degrees. So they declared it was too hot and moved to less exposed work after lunch. A storm came over. The rain ran off the sewn topped bags, but wet the wheat in those still open. And they had only knocked off because they saw the thermometer. Even Weatherzone cannot be believed. Scroll down to the bottom of the page and you will discover the hottest place in Australia this month is…. Warra in Tasmania! Hit the location and you will be taken to the monthly totals, click on the individual day and then sit aghast as you look at where the data came from. The mind boggles! After contacting Weatherzone, that errant number has now been removed. 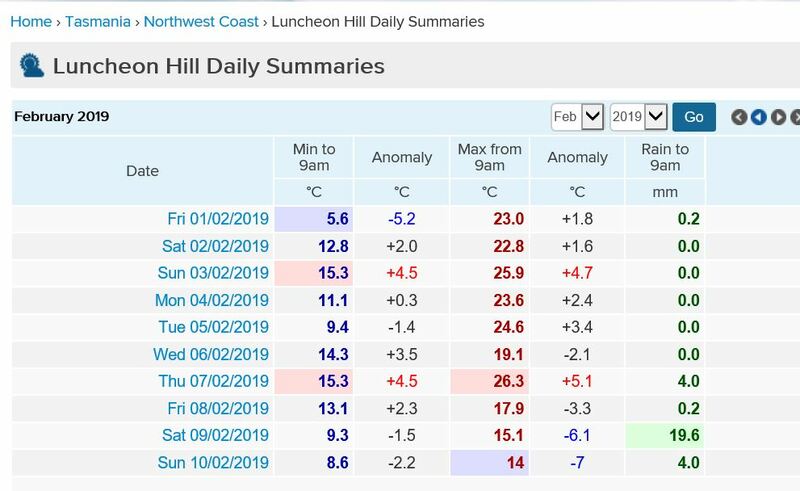 For this Tuesday/Wednesday 12/13 February, your B of M is calling for snow and sub-zero temps for Tasmania’s Mt Wellington and Victoria’s Mt Baw Baw, Hotham, and Buller. Dang, that Globaloney Vormink can do anything – ANYTHINK™! Meanwhile, the home of the UN – New York & surrounds – is in for an ice storm at the same time, complete with snow, freezing rain, sleet, and that 97% proof it’s getting hotter and it’s all our fault: ice, baby, ice! Ten days in-a-row without a sunspot, wobbly loopy jet streams, bitterly frigid cold waves sweeping both hemispheres – with Greenland and Antarctica vying for the coldest place on Earth with Siberia putting in a commendable challenge – cAGW has definitely run away . . . far, far away. Is Germany playing russian roulette with its economy? So what will repelace nukes and coal? Fairy dust? Has the green influence on the German people declared the population are untermunchen? Complete lunacy…the green globalist psychosis has taken hold….the green kool aid is running in the streets….complete madness…. “But this is not the first time German Chancellor Angela Merkel has pulled a stunt like this. In 2011, a few months after Japan’s Fukushima disaster, she abruptly ordered the shutdown of almost half the country’s 27 nuclear reactors and set a timeline to take the rest offline by 2022. BoM has no entry for 1 Feb so they have at least recognised an error. The other thing that has become obvious is the alarmist way that tv channels report the weather. Nowadays they describe 2 days in a row over 35 degrees as a heatwave and if they can’t tell you that Melbourne or one of the capital cities is crazy hot they pluck some random town like Oodnadatta and explain that the mercury reached 45 degrees for a week even though if one was to investigate it Oodnadatta probably is that hot every year. The alarmist narrative is shoved down your throat in a way which I’m sure subliminally impacts on people’s minds. There is no other way to explain how normal human beings have so erased their memories of past weather patterns and actually believe this alarmist crap. I can understand young children who have endured this indoctrination all their life would be so affected but what amazed me was when my wife mentioned that her fellow artists at her pottery studios ( all in their 40s-50s ) were fearful about the future of the planet. I cannot believe how gullible people have become. I fear that the deradicalisation of the population indoctrination of this global warming cult is more difficult than I could ever imagine. I consider this to be a form of abuse by the CAGW cult. Yes…you could say its a group of people ignorant of the science, but if consider the bulk of the population *are* ignorant of science generally, then its a form of sytemic abuse of the population and betrayal of trust. “One in three women under 30 involved in environmental groups are so worried about climate change and the future of the planet they are reconsidering having kids, according to a new survey. “The survey focused on women’s views on climate change ahead of this year’s federal election, and found nine out of ten of them were “extremely concerned” about the issue. For women between 30 and 39 years, 22 per cent said they were reconsidering having children or more children because of climate change. You had me for a second OriginalSteve and then I remembered that we’re the Thought Criminals with our sloganeering about CAGW zealotry and our ridiculing of the pretence that renewable energy can ever run Australia; we’re oppressing that population majority of innocent folks which needs to be told what to think. As for the climate snowflakes..this is what happens when someone gets bombarded with the same message over and over again. People eventually become scared of weather…any weather. Fear is an irrational driver of emotion, no doubt! Fear sells! It’s nice to see those old newspaper reports, they give a proper sense of perspective to the current CAGW hysteria. Yep all hot weather is a heat wave.. BUT now in the NH…. https://www.iceagenow.info/do-you-suppose-theyd-like-some-global-warming/ great picture of traffic stuck in a blizzard. With Seattle already receiving the most snow in February in 70 years ( 10.6 inches ) and “just” 2.6 inches away from breaking the record for the most snow in February at Sea-Tac airport ( 13.1 inches in 1949 ) we give you…the mountain was out today! So glad I live somewhere WARM. Never drops below freezing here even on a winter night. Never… Do you think it may be trending down and that within the decade you’ll find ice on the puddles in winter? Quite. “Never” is a hostage to fortune when used in conjunction with weather or climate. From time to time we comment about politics today and manipulative politicians intent on changing our nation to suit their own purposes, implementing UN agendas for example, giving away the sovereignty of our nation and even finding ways to get around the Constitution with no consultation (referendum) with the people they are elected to represent. There is one globalist Australian who has spent his adult life pursuing his ambition to change our nation. He stacked branches in the Electorate of Wentworth to become a Liberal MP but then undermined them, but set up smokescreens to cover his intentions, such as the Wentworth Group fund raising for the Party. He clawed his way into the leadership twice, Dr Brendan Nelson was the first after one year as Opposition Leader, Malcolm Turnbull was next for one year then Tony Abbott. But following six years as Opposition Leader for four years and Prime Minister for two years in 2015 Malcolm Turnbull became Prime Minister. The Timeline of History revealed in the website StopTurnbull is too long to post here. In 2018 Malcolm Turnbull decided to step down and retire from Parliament rather than face defeat again as leader. Since then his faction MPs have announced that they will not stand for election as a Liberal again or have reverted back to being real Liberals again. From outside Parliament Turnbull has revealed his close relationship with Union controlled Labor and the Greens. He and his son are now backing candidates campaigning as Independent however they have Labor’s activist organisation GetUp campaigning for them and Labor Leader Shorten has hinted that Labor will direct their candidate’s preferences to the no brand Independent candidates. One who is opposing Tony Abbott in his Warringah Electorate, a former skiing champion, has Green Tim Flannery as her advisor but like them all she claims to be a safe “sensible right” candidate, in other words better than a Liberal because they do not believe in climate change global warming as she does. Shorten has already indicated that if elected to government Labor will organise a plebiscite to determine, yes or no, if Australians are ready for a republic, that we rejected at a referendum during the Howard led Liberal-National Government years. Turnbull established the Australian Republican Movement and was very upset when the referendum rejected his republic. His sights are set on a new Constitution and the republic was to be the excuse for changing what politicians like him consider to be an old fashioned flawed document, because it gets in their way and makes implementation of UN agendas more difficult to carry out and if there was a strong opposition they could not do it. But now the truth is being revealed to all who were not aware, that there is a movement, a cooperative of politicians, working to end the unofficial two party system here and form a single party government that has absolute power. Turnbull has always wanted to get rid of the Liberal Party and National Party and join Labor and Greens with his own followers. And now they are attempting to achieve their goal in 2019 at the Federal Election. By stealth using pretending to be Independent candidates. The same tactic Labor has used in NSW State and then Federal 2010 election, presented as conservative Independent candidates in electorates unlikely to be won by a Labor or Green candidate. But they direct preferences to the Independent and, as happened at the Wentworth by election in 2018 after Turnbull retired, an Independent wins with a low primary vote, in Wentworth 29 per cent and preferences from Labor, Green and others. Unfortunately too many Australians have little interest in politics and are apathetic. The cunning politicians can fool them and use spin doctors and compliant media to do that. GetUp are spin doctors and media management people based on a US model, George Soros is a donor, the Australian unions donate and GetUp was established here with help from Bill Shorten when he was a senior Australian Workers Union executive, and he became a GetUp Director. Recent evidence I have noted are: When Turnbull retired Abbott remarked that the worst was over (for the Liberals), PM Morrison allowed Turnbull to represent the government at suctions in New York and in Bali but was not impressed when Turnbull spoke on matters outside his government brief and embarrassed the PM. Morrison said later that it will not happen again. Around that time some of the Turnbull supporters in Parliament, Liberal MPs, also turned their backs on him and two of them, Hunt and Frydenberg, are now facing Independent candidates back by Turnbull & Son and their Labor Green GetUp allies. The lobbying firm of NSW Liberal powerbroker Michael Photios has started donating to the Labor Party. Please note that Photios has been the chief executive (whatever the title is) of the NSW Liberal Party for years, he and other Turnbull people have been in control. They have been selecting candidates and when at a recent Liberal Conference delegates voted to return preselection of candidates to electorate branch members Liberal HQ has resisted making the change. It is said Liberals In Name Only (LINO) who are on the far left of the broad church that is Menzies Australian Liberal Party are more in tune with Labor Green side. Finally, during 2006 journalist Max Walsh warned, writing for The Bulletin Magazine, that the Australian Labor Party which had represented unionism in parliaments since unions were established has completed “a corporate style takeover” of the ALP and were replacing Labor MPs with union trained executives. Much more, but in short their objective is to control Australia’s governments Federal and State. Now the game plan is clear, a new coalition of leftists, socialism and globalism, “socialism masquerading as environmentalism” as PM Abbott once described it, are ready to make a grab for absolute power using the 2019 Federal Election. Please vote from last position Labor, Green, Independent and Liberal National above them all. And in the Senate keep the would be controllers of our nation out. I bet John Howard has rued the day he talked a despondent Mal Turnbull to stay in politics after losing the leadership to Abbott. He may yet more rue the day he banned firearms. The Liberal power broker in NSW is a traitor to the Libs and has been trying to wreck it from within for a long time , the Libs seem powerless for some reason to get rid of the cancer that eats it from within . I notice that the Libs now in NSW are promising batteries for homes if they win the election . Face it Dennis the grand old Liberal party we once loved is now LINO . Shorten has been saying “when” we take over and is not saying “if” any more . Poor fella our country if Union controlled Shorten Labor with Greens and Turnbull & Son associates win. MalEx444 is here to stay and I see him making a triumphant return to be the first President of The Republic of Australia. New York is O.K. but nothing beats Power. I wonder who pushed the implementation of the new state rooftop solar scheme for 300,000 lucky, interest free households. The only reason people want solar power on houses and now with battery back-up is to reduce their power bill. Electricity costs have trebled since “renewables” have displaced coal fired generation. Australia is heading back to the dark ages with the governments that keep being elected. If only the information from sites such as this one were able to be given more exposure through social media and msm , then the public might start voting accordingly. In 2018 Malcolm Turnbull decided to step down and retire from Parliament rather than face defeat again as leader. If overindulged in it can be more dangerous to your health than Fossil Fuel. Something inaccurate about that statement ahh gee? yes. He was voted out of the leadership. Are you ok today? No, he stepped down. He was not voted out. Ahh gee I’m going over to your well read blog to cut and paste again , Turdball didn’t re nominate which means he wasn’t voted out , seriously how slow do I have to talk for you to be able to keep up . By the way you still haven’t answered the question about the MSDS sheet you’ve copied on DDT , you haven’t actually read it have you , are you sure you’re not Fitz because you both have a habit of posting stuff you don’t read . How could he face defeat ‘as leader’ when he wasn’t? He finally realised that his run was over, cover blown and supporters dwindling. The wolf in sheep’s clothing exposed. If someone quits before they are sacked what do you call it ? Apparently double sacked . The only thing that recent heat waves might have done is fry the brains of far too many people causing them to hate the West and have a growing love affair with socialism. I suppose we will know soon enough whether Australia has a real love affair with socialism or not. If we do and it keeps growing in spite of the ensuring failings we can officially announce “move over Venezuela, we are next”. On Sky Outsiders it was mentioned that about 50 per cent of younger people here and in other countries believe that socialism is a better system for them than free market capitalism. And this is what happens when socialists are able to become educators of very young impressionable children, and ignore the history lessons that indicate what communism and socialism really represents. History and the events of today demonstrate that socialists are evil. They prefer chaos to order, prefer lies to truth, prefer death to life, prefer persecution to compassion, etc.. So what makes them more attractive to so many Australians today? Two main reasons. One, indoctrination through the schools, Universities, MSM and entertainment industry (mostly Hollywood). Two, lack of critical thinking that allows one to filter out the crap coming from those sources of indoctrination. Perhaps. However, I’d add that the millenials have been molly-coddled by their parents as if they were some precious god-like creation and hence think they should get everything they need for the rest of their lives without having to make any sacrifice. Wait for the tears and the tantrums. allowed to supplant educators and have access to very young, impressionable children for their own nefarious agenda. The abandoning of our children to purveyors of Marxist propaganda has been our society’s greatest failing. In any other aspect of treating vulnerable children in this way, we would call it grooming. Yet we sit, idly and watch and many even cheer. Just tragic. Absolutely tragic. That’s not caused by heat. It is caused by educators. Dennis beat me to it. The growing love of socialism by the uneducated (ie products of the dumbed down Western “education” system of North America, Europe and Australia/NZ) is a direct result of Cultural Marxism plus Rudi Dutschke’s “long march through the institutions”, the plot to put Marxists into educational and all other government and private institutions starting in the 1960′s and with a LONG term view. I think the term ‘cultural Marxism’ is stupid. It isnt Marxism (not defending all Marx theories either) its more like cultural Fascism. They try to relate the term to East EU communism which was started by the Bolsheviks, who were not pure Russians..look it up. I almost felt warm there for a while reading about the hot weather in Oz. -12F here in Montana. Actually sort of mild for this time of year but I’m to old to get out and enjoy it much any more. My question in line with Jo’s article is: Do any of these “IT”S NEVER BEEN THIS HOT” journalists have any idea what CO2 is supposed to do to warm the globe? Do any of these “IT”S NEVER BEEN THIS HOT” journalists have any idea what CO2 is supposed to do to warm the globe? They are the same as the average punter. They have no idea..they just repeat thought bubbles and cool slogans ..and own cars and their house is on the grid.. But at least they virtue signal that they care..thats ok right ? I believe the Aussies lost to India because they were crap and test cricket has been losing popularity for years , if you want the reason for low attendance look no further than the shorter form of the game . They don’t have the right balls anymore. That’s what happens when you play with white balls. Oh c’mon Robert. You don’t mean to tell us you prefer to watch 40 or 50 overs of high-action slogging over the fence, wild diving catches and colourful uniforms, when you have the chance to watch 5 days of some batsman blocking 2 out of every 3 balls, with droning commentary about who hit how many runs in Delhi in 1948, interspersed of course with 1st breakfast, 2nd breakfast and high tea, where the highlight of the day’s play was some seagull getting donged senseless by a stray ball? And after 5 days it still ends in a draw. No wonder they get the sandpaper out . . . the players are probably as bored stupid by test cricket as the crowd. My main regret is that they axed the stump-mic(rophone) from the early World Series days. That really livened up a broadcast. You couldn’t hear anything for the constant censor’s beeps. My attention span isn’t that short. My husband would agree with you MudCrab. He loves test cricket. anybody remember who said that after hydrogen, stupidity is the next most abundant thing in the universe? I just spent the weekend with some very smart people who had very fixed opinions about things like universal basic income, misgendered snowflakes, tax imputation and CAGW. as far as I can tell their standpoints were little more than self-referential gibber. When I pointed out that human contribution to atmo CO2 was about 3% total, I non-sequitur ranting about polar bears and sea-level rise before the pair of them settled on the Malthusian viewpoint that we need to cull the population. Their answer them is obviously to start culling denialists and work up to general wrong-thinkers over time. Spend the weekend with Peter Fitzroy did you ? could be … but then they all sound the same to me. Oh seriously? Like come, onnn! That is complete bull tish. Are you telling me that the ice sheets arent collapsing and that the sea level isnt rising and that there isnt global warming ??? Think of the bears etc. I said, we push 400ppm these days and got an equally outraged response …like what does that even mean? You need to put that in a context that NORMAL people understand!! So I said, well imagine the MCG full on grand final day yeah? Well if they represented molecules in the atmosphere … 40 people would represent CO2. I like to tell them that CO2 levels in a closed bedroom in the morning can reach 2000 ppm or more. Watching the reaction is hilarious. Don’t be so cruel as to wish a weekend with Fitzroy on anyone! Dr Spencer also thinks that our OZ hot Jan was mostly weather, not their so called CAGW. So far in the Nth Mallee in Vic this FEB has been very mild and this is home to OZ’s dried fruits industry and chosen by the Chaffeys ( in the 1880s) for our hot dry summers. Certainly this is just weather, not their delusional CAGW. Chief is having a look at Australian temperatures. If the temperature rises in Ultimo, it is definitely global warming. Not good for the ABC lattes. Yes, it’s nuts that fear of Global warming has a University professor terrified of summer. What is great about last week’s news is that young spokesperson Ocasio Cortez has finally told Americans that they have to embrace total government control Socialism because of the weather. Finally it has been said seriously. Not threat of war. Not social equality. Not racial discrimination. Not womens’rights. The weather. Fear of hottish days. I can only laugh at the timing. Marvel at the idiocy. Be amazed at the seriousness. And to pay for shutting down all of America she will just print more money. Socialism exposed. There will be a lot of Democrat and even Labor voters who see the light because of Ocasio Cortez. No subtlety. No grand plan. Real enthusiasm. Centre of attention. Believing her own nonsense. How embarassing for Pelosi, Schumer, Sanders and Corbyn. It’s one thing to herd gently people with vague fears. Another to say openly that stopping people from flying, driving and eating and working and paying people not to work will solve deadly man made Global Warming and save the planet. That’s just nuts. If man made Global Warming has retreated into ‘Climate Change’, Climate Change has morphed into Climate Crisis and no one believes that. It obviously isn’t true. Sorry, there is a Grand Plan. It’s so absurd, its no plan at all. Called the Green New Deal, a name stolen from the New Deal of Franklin J. Roosevelt in 1933 after the Great Depression. Except there isn’t a great depression. Barack Obama has tried to take credit for the massive improvement in the lot of all Americans but everyone knows it isn’t true. He had eight years to improve the place for all Americans and in particular for his black and Latino supporters. In fact he will go down as the father of the rise of ISIS and the appalling ‘Arab Spring’ which saw cities like Aleppo wiped off the map. However the New Green Deal is absurd that it is a monument to thoughtless socialist passion over any economics, reason or political savvy. Ocasio Cortez is a crash through politician, telling people what they want to hear, not anything which makes sense. Amazingly she is not even old enough to run for President until 2024 but her Green New Deal has been adopted by prominent Democrats. You can see a train wreck election coming and the end for Bernie Sanders. TdeF I hope you’re correct, but I have my doubts. Sure the Cortez fool is a real dingaling, but voters somehow managed to choose her for their representative. How can people be so stupid and I think you give far too much credit to loonies like Pelosi, Sanders, Corbyn etc. Don’t forget these fools actually believe we can change the weather back to the LIA and they are many decades older than the Cortez kindy girl. Check Breitbart. One theory is that whoever loses goes extreme, which is why they lose the next election too. It has been the pattern for a century, right and left. Hollywood will have to rage on for another six years at least painting Trump as a everything in their vast vocabulary of abuse. The fact that Trump obviously is doing a good job and is increasingly popular even with blacks, Latinos and women enrages them even more. This is the same sanctimonious Hollywood of the casting couch virgin, a group were totally unaware of predator producers and their staff and scheming opportunists. So a world of the unreal, the happy ending, a world where everyone is an actor and no one is who they seem. Also no one ever said it as clearly. Stirring nameless fears is one thing. Asking people to stop flying to save the planet it another. Why is it that these young communists (Occasional Cortex and Jacinda Arden) all seem to have mouths and teeth like Mr Ed? The Steggall donkey running against Abbott has Flannery as her climate adviser ( garrwwwd help us) and seems to have a GET UP connected person helping to run her campaign as well. Let’s hope the voters are not stupid enough to vote for these extremists. But I wouldn’t be so sure. I hope Abbott gets back in May but after the Phelps fiasco I’m not as confident now compared to a few months ago. I migrated to Victoria in 1974 and visited Perth at Christmas time. I waited for the Youth Hostel to open at a nearby pub. I’m originally from Wisconsin in the US and had never been in 42 degree heat before. I quickly learned that drinking three or four West Australian pots (roughly the size of small buckets) on a 42 degree day was not a great idea if you wanted to walk around with a pack on your back. I remember it well. Six weeks of 100 degree days and not a cloud in the sky or an airconditioner anywhere. Aherns in Hay street had wooden floors and a flying wire money change to a central cash station. It was like walking back in time, but the heat was dry and the beer was cold. I do remember it was the first place where the sun was so strong and the shadows so sharp I could feel the shadow of the pub verandah cross your face. Now it’s Global Warming, except it hasn’t changed. Nowhere I know has changed. No beach is any different. Not just in Australia but around the world. How on earth do the Global Warming pushers expect to keep people believing in runaway warming, rapidly rising seas, drowning cities when nothing has changed, not just in the last 30 years but in a lifetime? And how long can they claim torrential rain, floods, drought and even bushfires as proof of Global Warming when everyone knows these are weather events not Climate? After all, that is what they all say when it is freezing. How many models have luck built into them? Random events? Catastrophe theory? After all these vaunted computer models cannot predict any of the big weather events anyway, even El Nino and La Nina, so how good are they? TdeF: I live in the UK, and I’m 70 years old. Like you, I’d say that nothing’s changed. The British climate remains as it ever was, yet all the media garbage has convinced so many that we face catastrophe. Do the media ever look at historic weather data? Of course not. The Central England Temperature record gives readings from the year 1659. To entertain myself, I had a look at some average temperatures for the summer months (as defined by the Met Office these are June, July, and August). No year in the entire record has ever reached an average of 18C for these months. Here are the greater than or equal to 17C values , with the year. Why the frequency of these values seems to have increased in recent years is of course a matter for speculation. Given that we are told that the CO2 level pre-1750 was 280ppm, and it’s now 410ppm, and also given the fractional anomaly variations seen in Dr. Roy Spencer’s UAH global satellite record (over which the arguments seem endless! ), the anguished hand-wringing in the popular press in England suggesting that we are heading into a CO2-induced hell of our own making once again demonstrates the sensationalism of the media in over-hyping ‘climate’. Great figures. Remember these come from instruments and the instruments have changed too as both reading and technology absolute accuracy improves, so the values always must shift. Probably up. I believe this explains the slightly higher frequency. At least your scientists have bothered to go back as far as possible. This is probably pride in the job over such a long time. Ours at the BOM buried the pre 1909 results which were State results and so as far as I know we have no officially published summaries from before 1909. Federation was in 1901. So no one’s job apparently. Great excuse. You would think one of the 1600+ full time scientific staff might have made an effort in the last 100 years, especially in the business of Global Warming. It is likely the period 1900-1903 of the Federation drought when the monsoons failed was much hotter with a long very dry drought across the whole country. I am sure they would be published if the data proved Global Warming and conversely not published if they do not. There was no change in technology, so no excuse. In passing, Australians would be horrified at the low average summer maxima of 17C, but we range from the 11 South to 43 South, not the 50 North of London to the 56N of Glasgow. Most Australians are closer to the equator than 33South. Still cool UK weather means more work gets done where Australians are gathered around the bbq talking about ow much they are paying for electricity when the biggest export is now coal to China. If the Greens have their way, we will be grilling tofu. These links aren’t obvious on their website – it’s much better to put the doom mongering on easily accessible web pages, as you’ll see! What is sad is people keep to themselves when they have had a gut full of a-holes and these SJW are the most malicious people that I have met. Climate Change activism is their indulgence. As Ocasio Cortez has made abundantly clear, it is also their entire argument for socialism, government intervention and control in every aspect of your life. Kid’s today eh. They don’t know what it was like when we were kids, you try and tell them and they won’t believe you. I’m sure Monty Python did this better. Nobody is denying that global warming is real, but if CO2 hasn’t caused that warming then we need an alternative hypothesis. Any suggestions? What are those four extreme weather events? opps, sorry, I forgot that posters to this site do not understand irony. Townsville has flooded MANY times in the past. None of these events is at all out of the natural climate variability. Its all just brain-washed FANTASY on your behalf, pfutz. He is beyond reason Andy. A shell of an individual who has had his intellect compromised. Peter is many, unfortunately. The floods in Townsville are a natural occurrence, same as the floods in India and Japan. The Californian bushfires are a direct result of eucalyptus trees in an alien environment. And failure to maintain the hinterland and electrical supply system. BOTH these failures are down totally to the green agenda. Natural like butterflies yes they are. I don’t remember saying that they were not natural. But their intensity makes them extreme. This has nothing to do with C02 and climate change, just a definition of what an extreme event is. I’d like to see the link for the Eucalyptus, as that fire was outside their former extent in california. So I will take it as a given that you agree that these were extreme events. Townsville like most coastal Queensland cities and towns is built on a flood plain. The houses described as High Set Queenslanders were designed for flood events, but now the Klimate Kids are building ground level concrete slab foundation and wonder why their homes have been flooded. Peter, a short history lesson …. About 130,000 years ago the ever changing climate resulted in drier conditions for the land we call Australia and the rainforests retreated and were replaced by what we see today, vegetation that must have the occasional fire for seeds to germinate and for regrowth to take place. Nature provided fire by lightning strikes. About 65,000 years ago the migrants settled on this land as it was at the time, where the Gulf of Carpentaria is today was sides of a huge lake where many Australian Aborigine tribes camped to shelter from the Ice Age 18,000 years ago. When the Ice Age passed and the warming commenced again the ice started melting and continues to melt, but there was a pause during the Little Ice Age a few hundred years ago. Earth Cycles, warming and cooling periods since time began, and now a new cooling period has commenced. Bushfires are best dealt with when cool, if there is a build up of fuel on the ground very hot wildfires are likely. The Aborigines watched how natural fires cleared the ground and encouraged growth of native grasses which attracted animals and provided black seeds to eat. So they copied nature and traditional seasonal burning off was developed. To claim that climate change increases fire risk is nonsense, the original people knew more than modern extremist Greens. Big events, sure, but they have happened before, and will happen again. LIA was an Extreme event. 300 years of bitter cold in an otherwise warmer 10,000 years. Sea ice in the mid late 1970s was an extreme event up there with the levels of the LIA. What is “extreme”, pfutz, except your brain-washing? I’ll pay that, but they are no more intense than the historical norm. I’ve been searching for a graph to show the world precipitation rate for the past 100 years, to test a theory, but no luck so far. Any help would be appreciated. Southern India precipitation depends on ENSO. ‘ENSO events that have coincided with abnormally high sea surfaces temperatures in the Indian Ocean—in one instance during 1997 and 1998 by up to 3 °C have resulted in increased oceanic evaporation, resulting in unusually wet weather across India. Such anomalies have occurred during a sustained warm spell that began in the 1990s. ‘A contrasting phenomenon is that, instead of the usual high pressure air mass over the southern Indian Ocean, an ENSO-related oceanic low pressure convergence center forms; it then continually pulls dry air from Central Asia, desiccating India during what should have been the humid summer monsoon season. ‘This reversed air flow causes India’s droughts. The extent that an ENSO event raises sea surface temperatures in the central Pacific Ocean influences the degree of drought. Around 43 per cent of El Niño events are followed by drought in India. Tokyo was wet in the 1940s and the 1990s, two examples of global warming. I guess Hokkaido at MINUS 32C at present is also due to global warming. What a wanker this Peter Fitzroy is. It might be a sign of something happening, extreme precipitation events in that part of the world are triggered by air from the stratosphere invading the upper troposphere. It’s clear you don’t “do” math or science. Power is cumulative the time integral of energy, it’s power that warms. Each year is offset from the last, if gains dominate it’s hotter if losses dominate it’s colder. This is called a random walk, it also means that hot/cold times cluster. You on the other hand want to say that because the latest years are clustered above the average of the last 30 AGW must be true. Not relevant, it’s warm this year because it was warm last year. I give you lots of math to show you why you are wrong but you never do any of it. This pathological need you have to “just believe” perplexes me. Answer just one question for me, why won’t you do the math and check for yourself? pfutz is one of those pitiful people who is basically incapable of doing anything himself, so he HAS to rely on what those he sees as being the “consensus” to tell him what he should think. I doubt a single rational scientific thought is even possible within that green sludge inside his skull. bobl – when an authoritative source tells me that 9 of the 10 hottest years were this century, I take it as a fact. Now as to Belief. I accept facts, I trust science, it’s given medicine, computers, non-stick fry pans, the list is endless. I have no need to believe, at least in the way that you are implying. And no you haven’t mathematically proved anything, just links to the far far fringe. Still well below almost of the last 10,000 years. Records start basically at the coldest period in 10,000 years. And the “adjustment” of data means that nothing is really worth bothering with before 1979 except by looking at raw data. Raw data shows NH was probably warmer in 1930/40s, or about the same as now. And the RWP and basically all the Holocene before that was also warmer than now. We live in COOL-TEPID times. ! And no, you don’t trust science..
You have shown that YOU DON’T HAVE ANY. And you REJECT any real science that goes against your AGW brain-washing. …..when an authoritative source tells me that 9 of the 10 hottest years were this century, I take it as a fact. It may be a little OT, but it goes to the point of this matter, where Peter Fitzroy takes as fact a voice from authority, enhancing his ‘belief’ to the point that he then does not need to find out for himself. …..but you underachievers try to tar me with the CCS brush. Read, try to comprehend. When you have to bury around 800 Million Tonnes of CO2 in a geostable formation FOREVER, so that CO2 never seeps back to the surface, JUST FOR THE ONE LARGE SCALE COAL FIRED POWER PLANT, just one tiny part of that process makes it all but impossible. The rest of the process is a little too complex to include it all here in one short comment and is explained at this link, from four years ago here at Joanne’s site, a repeat of what I found out for myself more than ten years back now. So Peter Fitzroy, ….. Read. Try to comprehend. Find out for yourself. Don’t just blindly believe a voice from authority. If his CCS was big enough and powerful enough, he would eventually bleed the oceans of CO2 and turn them Alkaline. Oops, that should be more alkaline. What belief is needed. I accept the results, I accept facts. Like the AFR article quoting the head of the minerals council, about the mix of generators. This is a fact, as unlike Germany for example we have to do energy security and capacity by ourselves. Now for your 800 million tons of C02 comment – that is one of the pesky externalities which the proponents of coal don’t want to talk about, others being health, land degradation and so on. I remember your post that you kindly linked to. The US Nuclear Energy Institute suggests that the cost of fuel for a coal-fired plant is 78% of total costs, for a gas-fired plant the figure is 87%, and for nuclear the uranium is about 14% (or 34% if all front end and waste management costs are included). * Prices are approximate and as of March 2017. However, if you believe that C02, methane, sulphur, nitros oxide, particulates, and fly ash are not to be counted, then that would be a false belief indeed. Here in Australia, most coal fired power plants are at the site of the coal mine itself, and the plant owner also owns the mine and the coal in it as well, so the only cost there is to mine it. The plants in Queensland, while some of them are not on the direct site of the mine itself are State owned, as are the coal mines where the coal for the plant is mined, and taken to the plant on State owned rail infrastructure. I take it you now accept that CCS will never be realised on any scale, let alone the scale required. And a CO2 Tax is revenue neutral, as the whole cost is passed down to the end consumer of the generated power. And Cap and trade is also a zero option as well. When the construction cost is higher by a factor that is so immensely huge, then all other externalities are incidental by comparison. Yep, should be a BIG PLUS for coal. Helping to feed the world’s population. There is ABSOLUTELY NO DOWNSIDE to releasing that amount of CO2, over time, into the atmosphere, where it used to once be. It is a BENEFIT, not a cost. Land degradation.. you mean like wind turbines destroying large tracts of land, and all the rare earth’s mined for solar panels ? Try making wind turbines and solar panels without using coal and steel..
particulates, Sulphur and NOx, all well contained by a modern power plant. Flyash, used in roads and cement. Again, just an ignorant comment from pfutz. The same source tells you to jump of a high rise building you would do it right ? The past 18 years have been the hottest this century. They have also been the coldest 18 years this century. Excuse me, but I have given you the math I never post links because the math speaks for itself but you never attempt it, never comment, never even ask a question as to how to apply the math properly. The problem is that as you yourself say you are accepting a view of others being presented to you without checking it. For example there was a paper that claimed global warming was causing over 300 cubic kilometers of ice melt issued by a PHD scientist. You…. according to your own statements accept the claim uncritically because said scientist says so. Me, I did the calculation 300 cubic kilometers of ice over 2 million square kilometers of west Antarctica requires 30 to 60 Watts per square meter to melt. Global warming supplies just 0.6Watts per square meter, conclusion west Antarctica ice melt CANNOT be being caused by AGW. Wrote to the authors who acknowledged that they did not bother checking the power requirements for their claim was actually met! Why should we bother interacting with you if you won’t check stuff. IPCC claims on increased rainfall violates the law of conservation of energy. At various times I’ve given you the tools (the math and science) to verify what I say but you never check… blind faith is all you have, why do you never examine your sources… I do. You love to rely on specialists, but when a specialist in electricity like myself tells you that Solar and Wind power cannot solve this problem you refuse that specialist advice. Climate scientists and greenpeace know nothing about energy and electricity, that’s pretty clear because in writing to a half dozen of them I find they never check the energy balance of their claims, Energy and electricity is my specialty as an Electrical Engineer why not accept my expert opinion about energy…. Blind faith maybe Peter? Having said that I am always prepared to lay out a calculation to be proven wrong, you never even try. Wrong bobl. Energy is the time integral of power. I am sure you meant that. Yes, I got that backwards. See I do make mistakes occasionally. You mean the one where there is absolutely NO EVIDENCE that warming or climate is in any way affected by increased atmospheric CO2? The one that is just taken “on faith” like a baseless religion? Yes , I can see you take lots of bubbly. There is such a thing called the co2 gravy train. And pfutz is probably worried he hasn’t paid his fair yet. He has no tickets, except on himself. The only reason anyone talks about the highest years is that it is all they have left. World temperature, no matter how silly a concept in a chaotic system, is not changing. That is amazing. Runaway CO2 caused catastrophic Global Warming is fake. Things going up and down are real. Without modern thermometers we would be pressed to have any chance of identifying a change at all. Then for the last ten years, you need to get down to 0.01C to work out which year is which. Personally I feel something happened in the switchover in instrumentation between mercury thermometers and electronic over ten years. This is normal, but there was no attempt to correct it. After all the new temperature should be more precise and if the old temperatures are lower, that fits the story so no one bothered. 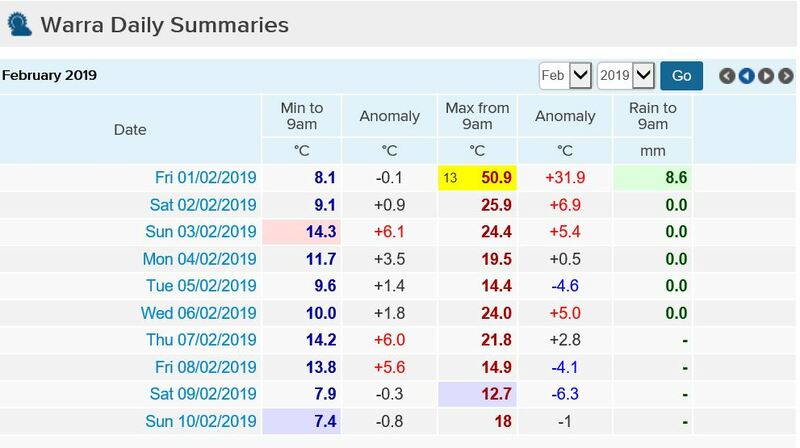 There is every chance the older temperatures need to move up 0.5C and then it is all over. As for man made CO2 increase, that is a lie. Certainly BOM’s 1 second methodology is going to yield occasional very waywardly high results.. which is exactly what they want. It was German employee of the Weather bureau who kept the instruments side by side for a decade. Germans do that sort of thing. He could prove a 0.5C difference but no one wanted to hear it. What do they do, adjust all the old temperatures up? This is not unexpected when you swap from a human read instrument with +/-0.5 reading accuracy to a better calibrated electronic one with 0.001C resolution, even without the faster reaction times and so higher maxima. However it suited so many people, you have to think there was real motivation in saying nothing. Germany leads the world in giant windmills, even those made in other countries are typically German owned, German design and under licence or joint venture. Global Warming has made Germany richer. And the French own the desalination business. So another group who believe fervently in Global Warming, from the merchant banker President down. There is now an effort by the MSM to link weather with climate. That link you didn’t provide yesterday Fitz I’m sure shows Co2 going up and world temps starting to go down . How can we believe anything you say when half the time you make stuff up and the other half you get your info from dodgy greenie sites , even worse you don’t even check the links yourself to make sure they support your argument . Have you ever acknowledged your stuff ups , any of them , even once ? No you just keep trolling trying to spread the faith . My lapses which I do admit, are quantitatively in line with the standards for this site. For example, the statement by Bill about how the polar bears are protected, should have got the same serve from you, but no you didn’t do that did you? Polar bears are protected and they are doing fine. Canada and Russia (who just shot 52 of them) do not protect them, Norway and the USA do. given the size of the arctic boundaries for both Russia and Canada, the conventional wisdom on this site would be that the USA and Norway should not bother. That being the case why did you not excoriate Bill? Russia doesn’t protect polar bears, partly because there is no way they can police the area, and partly because they don’t believe any global warming is happening. Canada does protect polar bears except it does allow the indigenous areas to license some hunting to collect finance and to protect locals. Since the polar bear population has grown from (estimated) 6,500 in 1965 to (estimated) 25-30,000 in 2018, it seems that ‘globalwarming©’ either suits them or there hasn’t been a huge number of shoutings. As for Bill, are you referring to Bill Shorten? Has he announced that “by 2020 no australian polar bears will be shot?” Would make more sense than some of his policies. Polar bears not protected, starving and forced to inhabit human settlements due to climate change eh Pete? This is getting very tiresome. So protected then if the BBC is to be believed. From where did you pluck your figure that Russia just shot 52 of them? 52 bears were reported in the vicinity of the settlement . . . not shot. It’s the numbers and the bears’ intelligence Peter. Too many apex predators equals bears coming into town scavenging for easy pickings more than in the past. The bears have lost their fear. Hunting in Russian territory is banned. Hunting in American and Norwegian territory is banned. Even in Canada where they are hunted, they are building up and becoming a threat as I posted yesterday. It won’t interest you to learn that many animals have changed their habits to take advantage of man’s presence. •	Flying foxes like to hang around orchards — is that climate change or animals doing the bloody obvious? •	Aussie snakes prefer to hide under corrugated iron sheets rather the sheets of bark — is that climate change or were they secretly adapted to living under corrugated iron? •	Foxes living and breeding in large cities — climate change or intelligent behaviour? •	Ibis and seagulls swarming at garbage dumps — climate change/too little ice or exploiting an easy food source? Also having travelled across Russia, most is uninhabited and largely uninhabitable. Endless arboreal forests, thousands of kilometers, much bigger than the Amazon. Then Kamchatka and Sakhalin and more. Filled with wildlife from Siberian tigers to big bears and endless animals who can survive the long terrible winters. Until summer, people are trapped in their houses and cities, as you would be in -55C. If you sleep outdoors and the weather doesn’t kill you, the bears and wolves and other wildlife will. Humans are the protected species. Wrong Peter though that does not stop people taking control of a problem;just like big crocs in remote OZ. What is the meaning of “hottest years recorded”? I suspect you are referring to the global mean surface temperature as sampled and averaged all around the world and throughout the year. I don’t see how you can use its values to draw conclusions about high summer maxima or low winter minima in local regions. The “hottest year on record” might, for example, be entirely down to mild winter temperatures in both hemispheres, with summer temperatures being no higher than usual. This is of course what’s daft about trying to reduce the whole world’s weather down to a single number. Sure, it can be done, but it’s just a geographical version of numerology. So when were the 10 hottest years then? You mean there’s something you don’t know? Well, in the back of the book you’ll find the answers. In the back of mine it says: “During the Medieval Warm Period and previously, during the Roman Warm Period”. You need to get an updated edition, Fitz. I was not arguing which were the hottest years, just that the global mean temperature tells you nothing about extremes. Nothing at all. But on the question of which year is the Earth’s hottest, that requires a definition. The climatologists have chosen to average temperatures from weather stations around the world and throughout the year. But that makes the hottest year merely the highest average temperature. If you think about how we define “hottest day”, it’s the day that reached the highest maximum temperature. Why don’t they use something similar for years? Global mean surface temperature is of no practical use, but has been politically handy for convincing the dimmer witted. That comment would be in line for the most” circumlocution in a single paragraph” award for the day. What you are saying is that you can not use a global measure (in this case heat) in reference to global warming? I’m guessing that you will apply the same logic to C02? Sea Level Rise? Interest Rates? OK, maybe not interest rates. Since there are over 10,000 weather stations, maybe we should use those? Oh, wait, we do that already. That is true, the whole temperature thingy is folly. There has been massive model failure, it now appears CO2 doesn’t cause global warming. Sea level rise is well within natural bounds. Off into the weeds (or should I say the conservatory with added C02) – the debate is about the relevance of a global value, for C02 or Temp, or even sea level rise. it was not about causes. roflmao,, so you admit that you have lost the debate on any cause. Distract and evade.. the AGW apostle meme. You have realised that there is no evidence to support warming by atmospheric CO2 and no evidence of CO2 influence on climate or sea level rise. Bit cocky for someone who said sea ice was at its lowest evah and Germany had cheap electricity at only 4 cents kWh . You’ve been giving Bill some stick you hypocrite how about you take a leaf out of your book . I admitted my mistake higher up the thread, but you, in your unreasoning hate, continue your attack on me. When I suggest that I’m not the only one to make a mistake, that means nothing as BillinOz is a member of your caliphate. It’s got nothing to do with “hate”. That’s a snowflake’s defence. 2. show us your analysis that supports your assertion that you pay $100 pa from your “fully paid off” solar panels. Nobody hates a CLOWN, pfutz. Any hate here is that which you bring with you. And it is a deep seated part of your whole lack of person. What a sad, miserable life you must lead, if childish trolling is the way you choose to spend your time. You admitted nothing putz , you did however insult the contributors to this website . Again your lack of basic education is letting you down. You cannot get anywhere near an approximation of the real surface temperature with a load of sparsely located , urban heat and airport affected, load of basically junk data. The more garbage data they use, the more they have to “adjust” it, and the worse the final fabrication becomes. BEST is a prime example of that. I’m prepared to accept whatever result they produce, even if it proves my premise wrong. … the method isn’t the madness that we’ve seen from NOAA, NCDC, GISS, and CRU, and, there aren’t any monetary strings attached to the result that I can tell. … That lack of strings attached to funding, plus the broad mix of people involved especially those who have previous experience in handling large data sets gives me greater confidence in the result being closer to a bona fide ground truth than anything we’ve seen yet. Yes, Muller is a consummate con-man. Conned many people into believing he was “real” about science. Their methodologies are totally shonky and designed to give exactly the result they pre-determine. nah , no monetary strings whatsoever. They can’t be paying you much though. With your ineptitude, it wouldn’t be worth the waste of funds. You can’t even find any evidence that atmospheric CO2 causes warming..
-The urban heat island effect and poor station quality did not bias the results obtained from earlier studies carried out by the U.S. National Oceanic and Atmospheric Administration (NOAA), the Hadley Centre and NASA’s GISS Surface Temperature Analysis. The team found that the urban heat island effect is locally large and real, but does not contribute significantly to the average land temperature rise, as the planet’s urban regions amount to less than 1% of the land area. The study also found that while stations considered “poor” might be less accurate, they recorded the same average warming trend. - About 1/3 of temperature sites around the world with records of 70 years or longer reported cooling (including much of the United States and northern Europe). But 2/3 of the sites show warming. Individual temperature histories reported from a single location are frequently noisy and/or unreliable, and it is always necessary to compare and combine many records to understand the true pattern of global warming. -The Atlantic multidecadal oscillation (AMO) has played a larger role than previously thought. The El Niño-Southern Oscillation (ENSO) is generally thought to be the main reason for inter-annual warming or cooling, but the Berkeley Earth team’s analysis found that the global temperature correlates more closely with the state of the Atlantic Multidecadal Oscillation index, which is a measure of sea surface temperature in the north Atlantic. he (Muller) certainly fooled Watts then. And you REALLY believe that. You are one GULLIBLE little monkey !! There methodology was that of a 10 year old. They wouldn’t have the vaguest clue about the quality of any of the stations used in their fabrications. I once asked them to identify where a random 6 of their “stations” were, and they couldn’t find one of them. JUNK in, even worse JUNK out. Yes, Anthony believed Muller was an honest person. Not any more. ! At least I don’t leap into denial mode, every time a result does not confirm my bias. The Berkeley Earth study had it’s experimental design approved by the skeptics. But the results did not fit your Belief, so now you disparage the authors. Don’t fool yourself. You live your life in DENIAL of reality. BEST is a con-job at best. Look at the awful science, or lack of it, behind everything they do. Oh wait. You haven’t a CLUE about real science, have you. Junk records that haven’t got a clue where from. Random step changes to data with no proven justification. Urban heat decided by looking at lights from satellites at night. Ignoring what the site looks like, because they aren’t even sure where it is. Its one big pot of rancid NON-SCIENCE. So you just gullibly follow the wolf in sheep’s clothing. No, that wasn’t what I was saying at all. Suggest you read it again. Perhaps there were too many polysyllabic words in there — it was inconsiderate of me to mention the dimmer witted, but not to allow for them. As for mean surface temperature being a measure of heat, it’s not a useful one. People from your own side of the argument have the heat hiding in deep oceans and so on because they’re sure it’s here somewhere but it’s not showing up in the surface temperatures. Why don’t they come up with a measurement which includes the “missing” heat? From you , that is HILARIOUS, pfutz. Sorry you don’t comprehend what Robert said. We have seen that basic comprehension is NOT on of your strong points. We have yet to find one of those. AndyG55, I’m pretty sure he understands fine, but has no answer. At this stage he can see that trying to change the subject again isn’t going to work, so he tries to goad an angry response. Won’t get it from me, but I can see why you give him short shrift. Peter Fitzroy: The internet states that according to modern estimates, the surface area of the Earth is approximately 510 million square km (5.1 x 108 km2) or 196,900,000 square miles. Ten thousand weather stations aren’t going to give global coverage, are they? The hottest summer in England since thermometers came into use was in 1846. After that came 1976. Then there were a series of hot summers in the 1730′s so much so that H.H. Lamb noticed that 7 of the 10 warmest summers in England were in the 1730′s. I haven’t the date of his comment and am quite prepared to admit that some summers in England recently have reduced that percentage. Of course if you go back to medieval times there were grapes growing as far north as Durham, very successfully as the Bishop got 3 times the price for his wine than imported french wine. There was even a comment by Chaucer that there was a walled vineyard outside Edinburgh (his father was a wine merchant) but I haven’t been able to track that comment down to the original. And the Vikings reaching Newfoundland called it Vinland because of the (native) grapes growing there about 200 miles north of where they grew when the founding fathers landed. If you go further back then the Holocene optimum was a time when giraffes, various bovine species and hippos were in the green Sahara. (see Tassili frescoes). And back in the Eemian, the previous interglacial, there were lions, elephants, giraffes and hippos in the Thames Valley. Ocean levels were about 6 metres above present due to lots of ice melt (although Greenland’s central ice cap remained as cores have been drilled to give records of the past 850,000 years). Actually, quantitatively in the current epoch they were in the Holocene Climate optimum around 8-10000 years ago. Here on the NSW midcoast I’ve been finding the summer unpleasant. Max temps have been in the low 30s but there have been lots of such days and very little rain. Though the winds have not been westerly and fire has not been a problem, the lack of afternoon relief has made for a “hot” summer. My point? Breeze and breeze direction have been okay. All of my discomfort – and a somewhat higher daily max – could be due to a lack of cloud. As said before, all statistics are bunk, but the bunk can be useful if helped along by commonsense interpretation. In more places than not, true “global warming” might well repress maxima and raise minima. Global warming some eight thousand years back brought about the Sahara pluvial…but did it raise maxima? What do people even mean when they talk of the world being warmer by a certain date? Do they mean the world will go humid and cattle will again graze the Sahel? Or are they talking about meaningless numbers attached to stuff that hasn’t even happened yet? I couldn’t car less if I fail the classical liberalism test. As a paleo-con I’m quite happy to see cheaper and better public transport, insulation requirements for new dwellings etc etc. That’s because critical resources like coal and oil are not for wasting. Also, I don’t know what the climate is going to do and it only has to do its worst for one day without electricity to kill me, so insulate. But Big Green just means more pointless made-somewhere-else consumerism and waste based on the most questionable of all human products: statistics. Melbourne’s had another cold summer. Down to 14C for a lot of yesterday. A short maximum. Even the few hot days have lasted only a few hours before a cool change. People have shivered at major festivals. Cardigan weather, not summer weather. We are grateful for 25C when I can remember 47C. February used to be the hottest month and Southern Australia is struggling to crack 25C. Interesting article from the GWPF about recent temps and forecasts for the next 5 years. They certainly make the most of strong El Nino years to make them feel better. Measuring the anomaly against C02 as an absolute, if it was against a C02 anomaly, I might give it some credit. Nobody cares if you give anything any credit, pfutz. You can’t even give any evidence that CO2 causes any warming at all. CO2 has absolutely NOTHING to do with climate. You really are CLUELESS when it comes to science and maths, aren’t you, pfutz. My right hand scale is CO2 ANOMLIES from 2001, oh brainless one. Don’t you comprehend even the most basic of maths ?????? Tell you what, how about YOU draw a graph of the “anomalies”, pfutz. Got any empirical evidence of warming by increased atmospheric CO2 yet, pfutz? Or do you still have an EMPTY sack. And anomaly is a deviation from a set value. What do YOU think an anomaly is ? 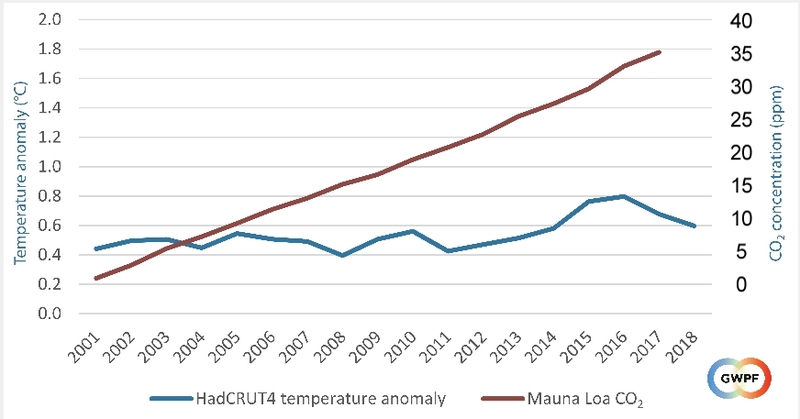 the left side is marked as a temperature anomaly, the right is marked PPM – and it is relative to the year, where the temperature, as you tenaciously point out is taken from an average of 30 years with the last year being 2010. OMG, its like talking to a low IQ 12 year old. Seriously, can you be any thicker ??!!! We are all waiting ! While you’re at it Fitz show us your evidence that man-made CO2 is the predominant driver of global warming. And, as a bonus, give us your analysis that shows you pay just $100 pa for your electricity as a result of your “fully paid for” solar panels. woah… remind me to hire you for my next publication. And what name you going to use ? Peter Fitzroy maybe ? I wish AndyG55 would not insult low IQ 11 year old kids. As to dare venture out, they might melt. In 1918, Jack Flick, the founder of Flick Pest Control (Australia’s best known pest management company) drove with his wife and two sons from Perth to Melbourne in a model T Ford -no AC no windows! Try that today! Last time I was in the same barren place (though further north by a few hundred km) without heating, it was so cold ice formed at the entrance of the swag I slept in. Bob Tisdale looks at the Global warming from 1916 to 1945 and finds that their so called modeling has been a disaster over that period of time. Interesting that the IPCC’s preferred temp data set( HAD Crut 4)has an even higher 0.167 c/ decade warming from 1916 to 1945 than GISS’s 0.150 c/ decade. See York Uni tool. We get loads of cyclists in the Adelaide Hills since this is the major sites for the Tour Down Under. So we get amateur pretenders clogging up our roads every day. A pack of them can make it impossible to pass safely on narrow roads. Fortunately we get 3 or 4 months relief in winter when it gets too cold for them to pose in lycra. once more with feeling. SE Qld has enjoyed a mild summer, and I have never had aircon and don’t want it. sport has been almost totally co-opted by the CAGW mob. all our tennis tournaments this year were held in mild weather, apart from a day and a bit in Melbourne (by which time there were only a few matches left to be played and a roof plus aircon, if required). commentators, nonetheless, talked of heatweaves during the Sydney tournament and Melbourne, when none existed. cricket. disgruntlement over the shenanigans of the Australian cricket team – and some poor performances – inevitably led to lower spectator numbers. in New Zealand, a cricket commentator felt the need to say NZ was suffering through a heatwave – and the temp went up onscreen – 30C. a voice could be heard in the background – Simon Doull I believe – saying “yeah, it’s summer”. a while later, Doull came back from a break with “it’s a pleasant day here in NZ – sunny and windy” – or words to that effect. if sports commentators keep up the CAGW propaganda – not to mention the other SJW nonsense – (and continue to talk incessantly) – even tennis/cricket tragics like myself may simply turn off the TV and read a book instead. Extreme: Even rarer and exceptionally intense heatwaves are classed as extreme and will impact normally reliable infrastructure, such as power and transport. So plenty of opportunities for scary “heatwave” headlines every week somewhere in Australia. Brisbane is forecast to have an “extreme heatwave” on Tues/Wed/Thur with forecast temperatures of 35/35/33. It’s probably something doodled up at the Extreme Weather Desk; there being so little of it they’ve redefined “extreme”. 2019 – zero dead, zero injured, 7 homes lost. The frequency may have something to do with regional cooling, but I haven’t checked the data yet. and the link above is the simplified conclusion to a peer-reviewed study of Tassie bushfires. OK pfutz, where is your graph of all the fires in Tasmania. Property damage is the whole point of your non-argument, isn’t it, ye of little mind? Hundreds of them over the whole history of Tasmania. Tasmania was the location ahh gee, you trying your distraction techniques from your well read blog again ? Only frequency I see Fitz is the amount of times you’ve proven you have no idea of what your talking about . Have you been to Tasmania? Maybe go to google earth and look up where the fires were located. Sorry Robert but that is a seriously daft comment. Yes, your comment is seriously daft , geegee. that’s excellent… as I was alluding, the extent of damage is correlated with proximity to habitation. Can you make one for large fires where no or little property was damaged? What more needs to be said. The big fire in the Huon Valley, 1960ish iirc, for eg, destroyed massive stockpiles of Huon pine but did very little damage to habitation. exactly, so as you and I have agreed debunker’s timeline of fires and their damage is just a meaningless list. I wonder what he was trying to imply? Any guesses? Really ahh gee so there were no bushfires in Tasmania in those years , is your foil hat too tight ? Basically what we have is a very dry area that burns readily, and bushland is being gradually encroach with houses. Topography is also hilly and weather can be windy. Sorta like parts of Victoria and NSW. Sorta like parts of California. The opposite of building in flood prone areas, so to speak. 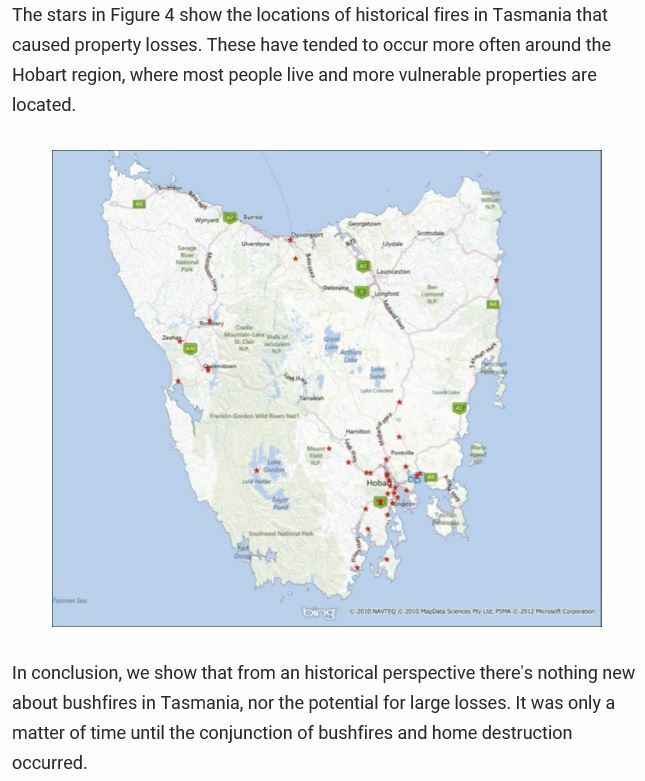 Couple of years ago I downloaded a report on Tasmanian bushfires which comprehensively rebuked any notion of Tasmania being immune in the past to bushfires . I’ve talked to someone in the industry and wish I could have recorded his comments on Tasmanian forestry management. Posted this earlier. 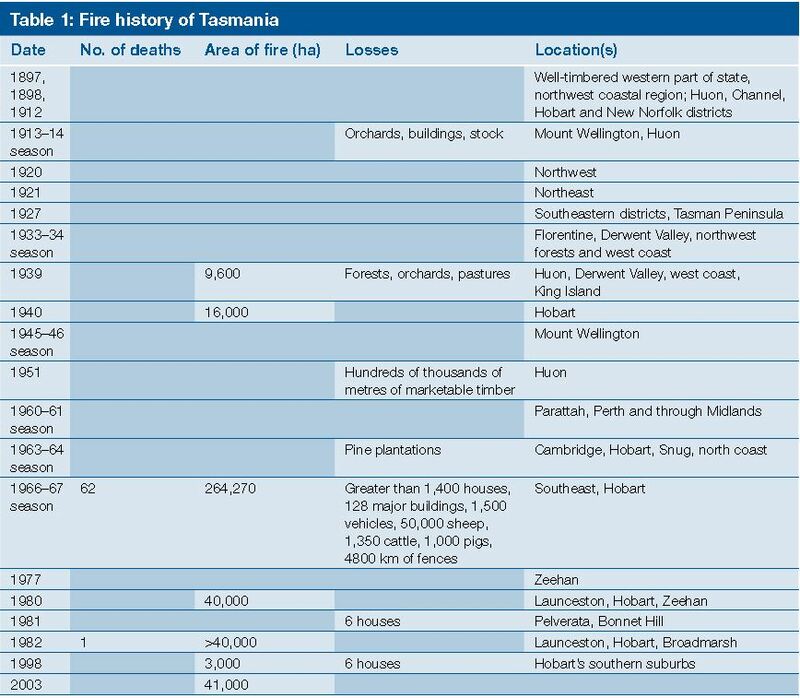 Long history of big bushfires..
Interestingly the houses most likely to survive the 67 inferno – were the ones without gutters. You mean like the greenies ensuring that fire trails are inaccessible? Or, that forest thinning is banned? Or, fuel load reduction burns are delayed for fake reasons like the weather being inopportune? etc? Or, the likelihood that greenies strike many a match to demonstrate their false assertion that bush-fires are becoming more prevalent? I heard a fire fighter say fuel loads were off the chart , which means not much if any preventative burning or fuel load reduction . THeres bad bush fires in Nelson NZ at moment, Nelson can get very dry and hot in summer. although ‘Stuff’ hasnt mentioned blaming climate change YET. Last week a judgement in a minor NSW court banned The Rocky Hill coking coal mine which had been planned for the Hunter Valley. Blogger Jo Nova writes that curiously, it was not the much hated thermalcoal mine, it was a coking coal mine – the stuff we use in making steel. It takes 600 kilograms of coal to make one ton of steel & Australian coking coal is considered some of the world’s best so it follows that either the world uses a bit less steel, or it buys the coal from somewhere else. This beggars the question of does the judge have something against steel? Nova joins Luke Grant, saying that most likely the world will buy the coal from somewhere else which will most likely be less pure and more polluting with few environmental controls or worker’s rights so effectively, an Australian court decided to increase global pollution by blocking a clean coal mine. Chris Kenny speaks to Michael Johnsen, NSW Member for the Upper Hunter, after the Rocky Hill coal mine is refused in court on grounds of ‘dire consequences’ to climate change. Di Montague, a member of Groundswell Gloucester, told fellow anti-mine campaigners, “we’ve won, we’ve won”. The result was being watched with interest internationally. Climate litigation, particularly in the US and European nations such as the Netherlands, is growing as climate campaigners frustrated by insufficient political action seek alternative routes to cutting greenhouse gas emissions. Will Steffen, an adjunct professor at the Australian National University who gave evidence in court about the climate impacts of coal, welcomed the result. “It is absolutely clear that the Paris climate targets cannot be met if we continue to open up new fossil fuel reserves,” Professor Steffen said. “Shutting the door on new fossil fuel developments will be a major turning point in the battle to stabilise the climate system – and will add further momentum to the shift to clean, reliable renewable energy systems,” he said. Justice Preston elaborated on his judgment, noting that “all of the direct and indirect greenhouse gas emissions of the Rocky Hill Coal Project will impact on the environment”. •It’s the first time an Australian court has heard evidence of a global budget of greenhouse gas emissions to avoid dangerous climate change to justify the refusal of a new coal mine. •It’s also the first time an Australia court has highlighted a mine’s contribution to total global greenhouse gas emissions – when cuts are “now urgently needed” – as a key reason to reject its approval. All such emissions add to climate change, Justice Brian Preston found. •Justice Preston, who delivered the decision, is also chief justice of the Land and Environment Court, and has sat as a judge in the NSW Supreme Court of Appeal. His seniority – and the superior status of his court – means his decision will likely carry significant influence in other courts across Australia. •The comprehensive nature of the judgment, including detailed assessment of the mine’s other negative social and cultural impacts, will provide hurdles for any successful appeal. Similar arguments are likely to surface in future coal and other fossil fuel approval cases. •The growing concern about climate change at home means parliaments would have to lean against sentiment to legislate to nullify the court’s precedent. Internationally, the decision is likely to add to the growing trend of global jurisprudence directly linking fossil fuels and climate change, elevating the risk that coal investments will be stranded, according to Martijn Wilder, head of Baker McKenzie’s Global Environmental Markets and Climate Change. However some Gloucester residents had supported the mine, arguing it would have created jobs. Dairy farmer Rod Williams from the community group Advance Gloucester said the judgement was disappointing. “Resources in this area have helped offset a lot of decline of our traditional industries over a number of year, or decades for that matter,” he said. Despite the ‘worst heatwave’ on record last month, only Port Augusta’s 49.5C made the top 10 of Australia’s hottest temp. Comes in =9th (6 higher in Jan and 2 in Feb). Still hasn’t been posted in climate extreme data as yet – awaiting confirmation? BTW, 1960 still holds the record. I have lived most of my adult life in California, where it frequently gets above 38C in the Summer. I had never owned a car with air conditioning until I moved to the mid-west, where it is more humid. It was my experience, while driving in California, that it was adequate to just keep one or more windows rolled down when it was hot. However, it was also my experience that above about 44C, it felt better to roll the windows up. Either way, one will survive. It isn’t enough to kill you. Although, I might suggest keeping a spray bottle in the car for those ‘rolled up windows’ days. The weaklings of today should be taken for a ride in a V8 engine truck with the engine between the driver and passenger seats, no air conditioning, for a long slow fully loaded drive in the middle of Summer. They would faint I’m sure and then burst into tears. I beg to differ Dennis. That’d burst into tears then faint I’m sure. Cornell University Law School Professor Robert Hockett, who counsels Ocasio-Cortez on environmental initiatives, challenged host Tucker Carlson when he quoted from an outline and list of “frequently asked questions” (FAQ) that had been posted on Ocasio-Cortez’s official website. A similar version of the FAQ was also shared with NPR. Even aside from the Green New Deal, conservative commentators have argued that most proposed solutions to global warming would do more harm than good, and also have accused climate activists of crying wolf. In 2006, a NASA scientist and leading global warming researcher declared that the world had only 10 years to avert a climate catastrophe — a deadline that has come and gone. compare how the FakeNewsMSM defends AOC with how they dishonestly portrayed Sarah Palin. why do these CAGW people always reek of smugness? The nascent field of climate litigation in Australia came of age on Friday. The Chief Judge of the NSW Land and Environment Court, Brian Preston, delivered a landmark judgment refusing to approve a new coal mine because of its impacts on climate change. In the Chief Judge’s words, the mine proposal was in the wrong place at the wrong time. When we first argued that our client, the Groundswell Gloucester, should be a party to this case and put a climate-change ground before the court, the mining companies thought it a laughable proposition, and said it would be “a sideshow”. As it happens, climate change became the main event in this court, as it is elsewhere. The ramifications are likely to ripple out across Australia and possibly the world. This is climate litigation writ large. Now the Land and Environment Court’s most senior judge has accepted the causal link between a project’s contribution to cumulative greenhouse gas emissions and global climate change. That, in and of itself, is a matter of great importance. We suspect we are only beginning to understand how profoundly influential this judgment will be on the legal landscape in Australia. This won’t be the last project consigned to the dust-bin of history on the grounds of climate change. It is just the first. Our new CEO David Morris came to the role having spent four years with EDONT in Darwin. So, how has his time in the NT influenced his approach to public environmental law? We asked about the highlights of his time heading up EDONT, why he became an environmental lawyer and how he stays optimistic. Q: You’re originally from Melbourne, but after four years in Darwin do you see yourself as a Territorian – or now a national citizen, with your move to Sydney? Q: When did you decide to do law? What led to that decision? Q: Which change to environmental law would you most welcome? We’re delighted to announce that Brendan Dobbie has taken on the role of Acting Principal Solicitor at EDO NSW, standing in for Elaine Johnson while she is on parental leave from 10 September 2018. Before joining the EDO, Brendan was a solicitor in the Planning & Environment group at Clayton Utz in Sydney. Brendan holds a Bachelor of Arts in Communications/Law (BA Comms/LLB) from the University of Technology, Sydney, and a Masters of Environmental Governance (MSc) from the University of Freiburg, Germany. Oops he sort of outs himself and his beliefs so no impartiality there . Its almost as if the whole episode was PLANNED from the start. Get someone to introduce “climate change™” into a case that should be fought just on environmental grounds. Then make sure the “right” judge is sitting on the case so real evidence doesn’t have to be brought forward. Right out of the leftist socialist handbook. Listening to Morrison’s speech now is giving me a ray of hope. If only voters swing to his support and smash the ALP+Greens. The next federal election will a humongous litmus test of the sanity and awareness of how close we as a nation are to crashing and burning if we let Shorten become PM. Peter when Turnbull left the House Abbott remarked that the worst was over. People who were astute observers understood what he was saying and since there have been former Black Hand Faction members or Liberals In Name Only moving back on side with the real Australian Liberal Party MPs. Evidenced by Hunt and Frydenberg now being targeted by Turnbull & Son & Associates all left of political spectrum supported no brand Independent candidates. Indeed. It’s not all over yet. The Libs still have a lot of house cleaning to do. They should now expel Turnbull from the party ASAP to send a loud and clear message the tables have turned. Otherwise, the stench of infighting will continue. Trouble is they are leaving it too late. It should have been done last year. Our only hope now is the people are not as stupid and asleep as I think they are. As I keep saying the next federal election is a significant litmus test. If we fail that test and Shorten becomes PM then we better hope the anti-left side, such as ACP and ON control the Senate. Now that both the House and Senate investigative committees have cleared Donald Trump of Democrat-inspired allegations of Russian collusion, it is worth revisiting one anecdote that escaped significant attention during the hysteria but continues to have U.S. security implications. Clinton’s handprint was everywhere on the 2009-2010 project, the tip of a diplomatic spear to reboot U.S.-Russian relations after years of hostility prompted by Vladimir Putin’s military action against the former Soviet republic and now U.S. ally, Georgia. The former president’s trip secretly raised eyebrows inside his wife’s State Department, internal emails show (LINK). The evidence shows the Clintons financially benefited from Russia – personally and inside their charity – at the same time they were involved in U.S. government actions that rewarded Moscow and increased U.S. security risks. so much evidence, yet no investigation? no evidence, yet this has dragged on for the entire Trump presidency. imagine what he might have achieved without this farce! The very objective, unprejudiced and unbiased Mueller investigation will show all that to be true when-ever the very honourable Mr Mueller finally decides to bring out his final report. Truth, justice and the American way. Regarding that historic newspaper clipping from 1932, the way climate data is being revised, such things may soon be the only true climate record we have. Such clippings are used and highly valued by Tony Heller in his videos. Predicted Donald Trump would win the election. So this guy has got a good head – and it looks a bit like I did 25 years ago. He just seems to be a bit short on the physics of solar energy. So I give him a pass. Has any one noticed that the latest Weatherbell GT Anomaly has plummeted in the past 4 days from +0.184 degrees C to the latest reading of to +0.125 degrees C. This is a very rapid drop in GT’s. No doubt linked to that September 2018 report by Martin Mlynczak of NASA’s Langley Research Centre that Earth’s Thermosphere (outermost layer of the atmosphere) experienced the lowest temp on record. Of course most of the MSM would never release such important data – it is “too inconvenient”. Mlynczak’s report is pivotal – it confirms that Earth has started cooling – GW is dead and buried for the foreseeable future. What’s worse for the “Warmists” is that this recent rapid drop in GT’s has occurred during a weak El Nino event. That El Nino is diminishing and what awaits is a Neutral PDO. And what happens if a strong La Nina appears in 2019/2020? More baloney again. 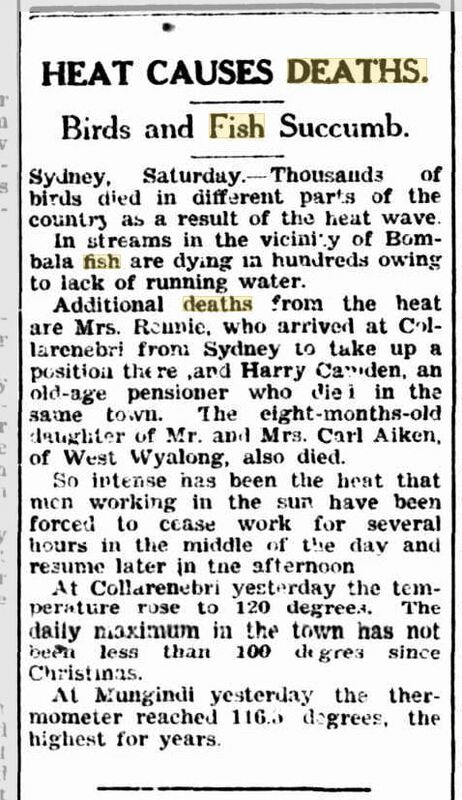 “The Uralla Times, Feb 1, 1932” it is well documented (where it hasnt been adjusted or deleted) that the 1930s were the hottest of the 20th Cent. from about 2min40sec in: anti-Klobuchar guy mentions the cold; Fox anchor interrupts “but you know global warming doesn’t mean it is iterally hot, it can be cold”. yes, says the guy, that’s why they changed it from “global warming” to “climate change”. President Trump poked fun at Sen. Amy Klobuchar, D-Minn., Sunday for vowing to tackle climate change as she kicked off her 2020 presidential campaign in a snowy, freezing Minneapolis park. Preserve her on acid-free paper for posterity. Meet Sarah O and Sarah H. They both grew up in intensely religious, intensely ‘anti-science’ families – one Amish, the other non-denominational Christian. only worth listening from 27min38sec when Natasha brings up Trump. I’m interested in the crucible you are all living in under President Trump, who is notoriously anti- or antagonistic of science, he and his administration. an Alabama climate change science sceptic was just appointed to the EPA Board this past week; this past week Trump has also come out with strong support for biblical studies in public schools, ramping them up. So there is a profound divide in America right now in so many different directions, religious conservative & liberal values; religious and non-religous. educated and non-educated and I just wonder, from your own experiences, do you see a way forward? do you see ways of bridging those rifts? first answer: Sarah O: anti climate change is fear etc. Natasha brings up facts vs values a couple of times, suggesting CAGW is a values thing? (NATASHA TO ABC AUDIENCE) Two 21-year-old women who, I reckon you will probably agree, are going places, big-time. Some responses to alleged “Climate Change” are just nuts. Consider the Climate Change survival clothes from Fashion Week in New York. a hood that pairs with the jacket has a mosquito-net face mask to protect from infectious diseases. the Fast Company website said in its review of the collection. “A bandana with interchangeable filters protects against smoke during fires. I wonder if you’ll think I’m nuts when you’re able to purchase some of the climate change footwear I’ve been designing. When I get them on the market you’ll be able to purchase a pair of thongs that adjusts to your foot size and is voice responsive. Say you’ve bought a pair, and you’ve gone out on a warm, sunny, day and suddenly it looks like it’s going to rain, and if it does it’s going to be very muddy where you are. You’ll say “warm and wet please”, and the thongs will become rubber boots, in less than one second, and you’ll continue to enjoy dry feet. Should you find yourself in a more extreme situation, for instance, should the temperature be dropping by many degrees and a snowstorm was on the way, and you’d be needing to ski home, you’d say “ski boots please” instead, and you’d be wearing a beautiful pair of ski boots, in less than two seconds. Or, say you suddenly got the urge to go trout fishing, or got caught in a flood, or maybe you need to climb a mountain and require mountain climbing boots. Just a few words away! Maybe you need a pair of classy dress shoes to wear to a Climate Conference. You voice the words “Climate Con please”, and in less than three seconds later you’ll be wearing beautiful shiny shoes sporting concealed solar panels that will have the capacity to power a fan or an electric blanket. I’ve got a couple of things to work out yet with the commands with regard to gender, but I’m confident I’ll be taking orders soon, and I’ll have the CO2 emissions reduced to an unbelievably low level by the time the factory is in full production. More likely a case of smart, free-market, entrepreneurs taking the piss. The only bit of apparel they missed was a designer labeled tin-foil hat. But that’s probably in next year’s release. Its incredible when you think about it. That is well more than half !! …. no wonder they say the world is warming.. Its been FABRICATED to be that way. Why is no-one being held accountable for this FARCE. !! You cant trust ANY data now. The whole lot is fake. I would be inclined to trust the Danish met service who seem to have what looks like reasonable ice data on the Greenland ice shelf. Thats about it. Any data on ice levels or other info is probably ‘adjusted’. Most of the earlier data is left out when it doesnt favour the ‘standard’ model. I am reading a book called Fossil Man by Michael H. Day, published in 1969. Back in 1969 they didn’t know about climate change. In an early section of the book, the author describes the geography during the period from 2 million years ago to 10000 years ago, when the earth was dominated by glacial and inter glacial periods. He says that during glaciations, ice locked up vast quantities of water and sea levels were low. Land masses were depressed by the weight of the ice, and recovered slowly as the ice melted in the inter glacial periods, a process which is still occurring today (around 1969) in Scandinavia where the melting ice cap over Finland is causing the land mass to rise by eleven millimeters a year. Now we don’t hear anything about land mass rising, all we hear is that the ice is melting because of rising CO2 levels and sea levels are rising. Its called isostatic rebound or isostatic uplift. The reason that the East US coast (esp. NY) has a tiny sea level rise is that it is sinking, the West coast has no sea level change. (I got that from a Tony Heller video). From hot to cold and back again they bounce and no one is happy. No matter what the temperature is, it’s wrong and it’s our fault, with one more off the wall theory thrown in for good measure. Can we get serious? If I didn’t believe the last 807.6 complaints thrown at me, how can they believe I’ll swallow any of these? And at the same time their proposed solutions get more radical — and dangerous. It will come to blows at some point. I’m serious. Are we ready to defend ourselves? What will I and a few hundred million others do if a bill just submitted in the House of Representatives suddenly makes the automobile illegal? It my not pass now but eventually it just might. We better have a defense ready. That’s how civilisations collapse; one small step at a time. Drip by drip. Unless there’s a great awakening by the population the trend down will continue to its ultimate end. The odd thing though is given modern communications we in Australia should be tuned into what’s happening around the world wrt climate change and the emissions scam. Most people here ought to know by now socialism is lethal. By all accounts support for Greens should be near 0 and ALP half of what it is. It’s as though Australia is on another planet so far away it takes decades to catch up with what’s happening elsewhere. Perhaps I’m mistaken and most people are indeed alert and the polls are fake. Time will tell of course. The U.S. is in similar shape to Australia only you have gone ahead of us a few years. My reading of the situation is that most people are not alert to the situation. But there are some who don’t believe climate change with varying degrees of certainty. How will it go? And I plain don’t know. With the usual luck, things will deteriorate not get better. NSW Minerals Council CEO Stephen Galilee tells Chris “the ruling against approving the project wasn’t that surprising”. “What was perhaps was surprising was the decision seems to be saying that somehow NSW needs to be doing more than our national Paris Agreement commitments. “Putting it into context, NSW does emit less in a year than a country like China does in just a few days. It’s an absolute sod having these newspaper cuttings, unlike the web you can’t just delete or alter the data at will. Folks Cheifio has been doing some really interesting coding work with charting temperatures across the planet. What emerges in the charts is 1) the extent of the BOM cut backs in weather stations after 1990 and the bias toward more densely populated areas of Australia. 2) That there seems to be very little actual change over the past 150 years in either Summer or Winter. In fact there is no lean at all ! Hi Jo, O/t, sent you an email re ROM which you may have missed. ACF chief executive Kelly O’Shanassy acknowledged that the survey was of members and supporters, but argued that her organisation is “very representative of mainstream Australia”. A poll for GetUp released at the weekend showed climate change was biting strongly as an issue in Tony Abbott’s seat of Warringah. Sixty per cent of respondents in the GetUp Poll said they would be more likely to vote for a candidate with a plan to replace coal with clean energy. Once, long ago, my parents drove 4,000km right across Australia in January, including 700km of dirt road over the Nullabor in an un-air-conditioned EJ Holden. I did the same thing, from Albany to Port Augusta, Summer 1971, in a BLACK Holden EK sedan, towing a huge Chesney caravan, which car my mum drove. The corrugations broke most of the glass in it. And my dad drove his brand-new electric-blue Ford Falcon GS towing the boat with its mighty 40hp Johnson outboard. The GS had a luxurious all black interior, thick black carpet, black leather bucket seats, black dash. It had these cool ash trays in the doors! But the real problem was it had a black vinyl roof. Why vinyl? Because vinyl was cool! Very cool! But it was also hot. tonight Chris Kenny on Media (Sky News) had a good piece on Richard Flanagan’s over-the-top piece “connecting” Tasmania’s bushfires with CAGW for The Guardian – “Tasmania is burning. The climate disaster future has arrived while those in power laugh at us”. Flanagan seemed to be trying to outdo NY Mag’s “The Uninhabitable Earth by David Wallace-Wells”, which was heavily criticised, even by some of the CAGW mob. Kenny showed loads of old film and newspaper reports of Tassie bushfires from a century and more ago. I learnt my trade as a forester in Tasmania, know these forests well, and now I work in bushfire protection. This is utterly heartbreaking to watch, even our grandchildren will never see these forests return. DON’T EXPECT ANY CRITICISM OF FLANAGAN FROM AUSSIE SCIENTISTS. 10 Feb: Independent Australia: This summer is angry: Are you? I don’t blame most of the people who wish global warming away. They have been deceived by the grievous omissions, gross distortions and outright lies pouring out of the media all the time. The media controllers, the opportunistic politicians and the self-interested bosses are the culprits. Why are insects in decline, and can we do anything about it? alignments on inter-decadal to centennial time-scales with the initiation of El Nino events. Moon Tidal cycle) you will have to slog your way through parts 1, 2, and 3. Here is a post that I mistakenly put on the weekend unthreaded comments section. to want to investigate how this forcing works. in and Preparedness for Extreme Weather Events in 2013. When will they start listening to alternative voices on climate change? I’ve heard of the 18.6 year cycle but not 9.1 , I’m going to have a look at past flooding episodes locally but from memory the 18.6 might just be close . At the same time I’ll check events around 9 years . The 9.1 year is in the world mean temperature record. It is not always present. It appeared to be weak or absent for about 45 years between about 1915 and 1960. Flooding has a different cycle which seems to follow the 18.6-year Draconic Cycle. The old eyesight is getting a bit ‘crook’ as my Aussie friends are won’t to say, but was that stupid professor really called Satanic? I guess Western Australia is the equivalent of Yorkshire. They dont make `em like that anymore.